Bored to wait for maps display? Use All-In-One OfflineMaps! Once displayed, maps are stored and remain available, fastly, even with no network access. Have a data allowance limit? It will reduce your usage. A lot of maps are available, including classical road maps, topographic maps, aerial (satellite) maps and various layers that can be added over any maps: OpenStreetMap (Roads, Topo), USGS National Map (Hi-res topo, Aerial imagery), Worldwide Sovietic maps, Google Maps, Bing Maps, Yahoo Maps, Yandex Maps, and various per-country topo maps (incl. Europe, UK, Spain, Italy). All maps can be stacked in layers, with precise opacity control. Stored space is clear and can be easily deleted. 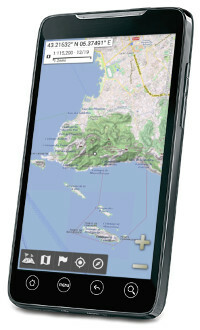 All-In-One OfflineMaps is available for all Android powered devices (including mobiles, laptops and tablets). Fully compatible with metric and imperial distance units, GPS Longitude/Latitude coordinates and grid systems (UTM, OSGB, Irish, Swiss, MGRS/WGS84, USNG/NAD27). Don't wait, try it right now! Fully featured version, ad supported. Support us by using this donation version. Ads are removed. Don't forget to visit the Online Help.